As part of our work on the Devolved Voices project, researcher Kathryn Gray has compiled a bibliography of reviews of work (pamphlets and collections) by our post-1997 cohort of poets. Drawing on this, Kathryn has compiled statistics illustrating the reach that our cohort has had in terms of reviews coverage. 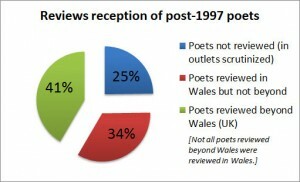 The team will be talking about this in detail at the upcoming 2014 Association for Welsh Writing in English conference at Gregynog, but here’s one taster of some of the data we’ll be presenting. have been reviewed in the wider UK. Please click on the pie-chart to enlarge it. Notes: (1) For a run-down of the publications that have been scrutinized as the basis for our data, see the introductory notes on the Reviews Bibliography page. (2) The information presented in this pie-chart is based on the following current data as collected by Kathryn Gray for the project: [a] an overall post-1997 cohort of 101 poets; [b] 675 reviews of pamphlets/collections by poets within this cohort (or 710 reviews, if hard-copy and online versions of the same review are counted individually).